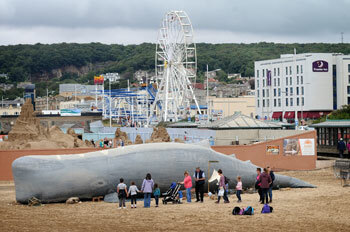 Having been banned by the Royal Parks in London for being too religious, a 50ft inflatable sperm whale is now finally beached at Weston-super-Mare in Somerset and able to delight children and families alike. The whale plays host to the dramatic retelling of the story of Jonah, the latest event in Bible Society’s Pass It On campaign, which aims not to promote any religious teaching but introduce children to some of the most exciting stories previous generations would have known. Research conducted by YouGov for Bible Society showed that whilst half of all parents think it is important for their children to engage with the Bible; in practice 59 per cent of children didn’t know Jonah and the Whale was a Bible story. The research further revealed that 29 per cent of children couldn’t identify the Nativity as a Bible story. The whale was then intended for a children’s fun day at Hyde Park and Greenwich Park in London but received the same feedback. The ban was issued despite the fact the Queen, who owns the Royal Parks, is the patron of Bible Society, and Supreme Governor of the Church of England. Rachel Rounds, Head of Media at Bible Society said, "The Royal Parks in London may have banned Bible Society from telling the story of Jonah, but Weston has saved the whale. "Recent research for our Pass It On campaign showed that 59 per cent of children didn’t know the story of Jonah was from the Bible. So we want to encourage the next generation to engage with great Bible stories and what better way than from the inside of an inflatable whale, told by a circus troupe?" Children are able to experience Jonah’s story in a dramatic retelling including singing, dancing and edible seaweed, from inside the whale’s belly delivered by the all-female, circus troupe, Circo Rum Ba Ba who have performed for everyone from The Queen to Sir Elton John. Eleven-year-old Stan from Weston-super-Mare said, "My favourite bit was when Jonah fell over board. It was really funny. He wasn’t expecting that the captain of the ship would do that." Rachel (31) a mother from Warwickshire, took her children to the event. She said, "It’s good for the children to see a Bible story. It’s nice for them to know." Darren Fairchild, Seafront and Event Services Manager for North Somerset Council said that for him, there was no controversy over staging the event. "It’s a bit quirky and fits perfectly within the seafront," he said. "If we can give the children an educational lesson here it sends them away with a positive message."